Whenever you go shopping a fishing reel, being a professional, you will never miss out to look at the latest items from Penn. Penn is one of the oldest brands that are there in engineering the fishing items and they are really good at it too. Among the different products that you will find in the market from Pen, this one, the Penn battle ii spinning reel is one of the best looking and best-crafted fishing reel for sure. 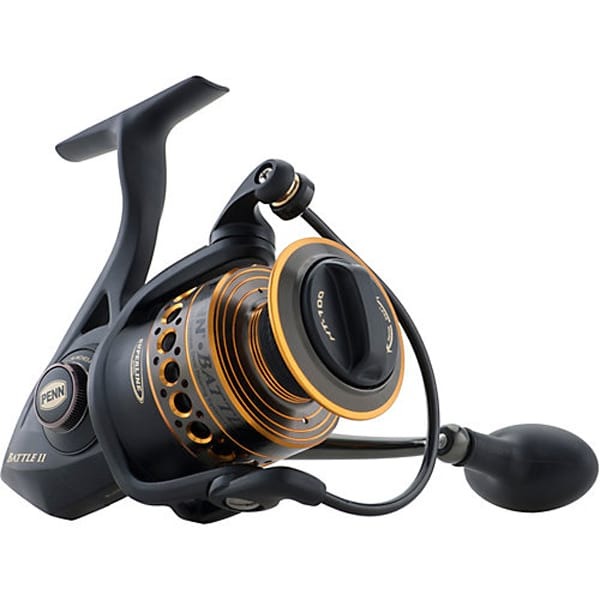 The excellent metal body of the device and the quality drag of the device make it one of the most durable fishing reels, which you can quite expect from any of the Penn items. The durability of the body depends not only on the material used over it, but there are some other aspects too, that configures the long-lasting ability. Same is the case with this item too. It has got a full metal body which covers the side plates and the rotor even, but at the same time, it is supported with aluminum bail wire. All these things when combined forms Penn battle ii fishing reel as the most durable fishing reel in the market. The high range spinner in the device is all set for you to conquer the saltwater fishes. Even if the device drops from your hand on the level of the spur, it will not be at all affected. Dragging ability of any fishing reel is not only dependent on the amount of weight, but it can also drag. There are other functions too that are able to cast importance on the dragging ability. One such thing is the smoothness of the device. Smoothness on the other end depends on the line lay. The Penn battle ii super dragging reel is having HT-100 carbon fiber in the drag system and that creates the biggest difference in the item from the other available products in the market. When this thing is added with the device, the dragging limit of the device must have to be high and that is the case here too. The fishing reel can drag up to 30 lbs if it is under some expert hands. Casting is the third aspect that you will like to check in a fishing reel. This device is not something with which you can cast to a huge distance, but the balance that you will find in the Penn battle ii Super-line reel makes it one of the best devices that cast with accuracy. Super-line spool in the device absolutely needs no backing as the braid remains ready all the time when you are casting. While you will be casting, you will also find that the capacity rings are properly identified in a perfect fashion. It is marked as 1/3, 2/3 and full. So, your understanding of strength can also be identified easily. This all makes the device perfectly aligned and balanced during casting, which directly influences the perfection that you attain during a casting. Fluid cranking in the Penn battle ii fishing reel makes it very much strong and balanced even, even when you are dragging at the highest level, you are not going to face any sort of slippage for that. This is why Penn is so much preferred by the professionals. In fact, they get all the things that they need from any of the fishing reels in the products of Penn. The device is outstanding in terms of dragging ability and casting accuracy. While it can be cast to a distance of 250 yards, it has a dragging ability of near to 30 lbs. Full metal body and a side plate make the device a strong one. It can be used in the saltwater too. Drag washers are made of carbon and they make the device durable too along with the best functioning. Super-line spool demarcates the class of the _ and also about the class of the brand – Penn. HT-100 carbon dragging system of the device makes the item one of the rarest one in the entire market. 5 stainless steel ball bearings are sealed for better durability and that is added with a preferred anti-reversal roller too. The weight of the device is only 1 pound and that attracts almost all the professionals at it. The weight of the device is very much low often makes the fishers struggle in casting during bad windy weather. The main gear of the device has been reported several times to break down after several time usages of the same. However, this is regarded to be a fault in that [particular product and not a generalized fault. The weight of the device is near to 1 lb, which is very much low. How many ball bearings are there in the device? There are altogether 5 ball bearings, made of stainless steel and they are all sealed for better durability. Is the device attached with another spool? No, you can get one, if you need by contacting the customer care team of Penn. What is the casting limit in the device? Casting limit in the Penn battle ii fishing reel is 250 yards. How much weight the device can drag? Maximum weight the device can drag into is 30lbs. All the fishing items from Penn are rated high for the excellent quality support the company provides. This product is like that only. The Penn battle ii spinning reel is having some of the excellent qualities like dragging support up to 30lbs, casting ability till 250 yards and excellent balancing technique. Collecting everything it can be prominently said that the device has been engineered with excellence and crafted with care. It is one of the worthiest items in the market to be bought and used by professionals.